Nonetheless, spying was quite common in that era and George Washington was its chief proponent. Washington made full use of the 1700s tools of the spy trade including invisible ink, hiding messages in feather quills, and small silver balls for hiding messages that could be swallowed in the event of capture. He also encouraged forging documents and making sure they fell into British hands. In the late summer of 1776, the British captured the City of New York and held it until November 25, 1783 and for almost nine years- it was the nerve center of the British Army. Accordingly, George Washington saw that if the nascent United States were to achieve its independence, he needed to know what the British were up to in the City and the surrounding areas such as Westchester County just to the north of the City. In this regard, he organized a network of spies and double agents under the command of John Jay, a resident of Westchester County who later became the first Chief Justice of the United States. From summer 1776 to winter 1777, he oversaw the activities of a New York legislative committee charged with &#8220detecting and defeating conspiracies.&#8221 The conspiracies largely were British attempts to use Tories to control New York City. Jay’s committee made arrests, conducted trials, and used agents to gather information. Reporting to Jay was another Westchester County resident, Elijah Hunter. He was born on August 4, 1749 in the Town of Cortlandt Manor on a farm near the Village of Bedford. After the Revolutionary war he settled in the Town of Mt Pleasant where the Village of Ossining now stands and he died on December 22, 1815 in New York City. As it turned out, Hunter led an eventful life particularly during the Revolution. “…do not conceive it would be expedient in you to drop the smallest hint by which he could discover the tendency of these inquiries, much more the time and manner of execution, if these should be the result of them, considering him as a double character, it is more than possible he would give some intimation by which the project would be ruined, if otherwise it bid fair for success. It is not known if the matter was ever resolved but regardless after the war, in 1785, Elijah Hunter purchased a large plot of land in the portion of the Town of Mt. Pleasant that now comprises the Village of Ossining. Roughly, this parcel stretched from the East where Route 9 now is to the bank of the Hudson River on the West, On the North it was bounded by Main Street and on the South by the lands where Sing Sing Prison now stands. aptist Church of Ossining that he helped to found. His house was on a lot on Hunter Lane now called Broad Avenue at a point where Broad and State Street now meet. Nearby was the Hunter family cemetery on State and St Paul’s Place. At the edge of the Hudson River he constructed a pier that became known as Hunter’s Landing and as a result of lower docking fees for than the one at Sparta to the South, his pier was favored by ship captains over the former and commerce in Sparta withered and Ossining boomed. Ossining’s Baptist Church was actually the offspring of the Baptist Church of Christ in Stamford, Connecticut where Elijah Hunter and his wife, Anna Drake, first worshipped. First Baptist was officially organized on November 12, 1790 with 33 members and Hunter was its first Deacon. Interestingly, First Baptist was a racially integrated church from its inception as it had had several “ Negroes” as African Americans were then called among its enrolled congregants. However, they were slaves. Among these was a woman named Lib belonging to Ruben Harrison and a man named Prince belonging to Hunter. In any event, slavery was abolished in New York State in 1820 and the African American residents of Sing Sing continued to worship at First Baptist. In 1890, these African Americans formed the bulk of the founders of the “Centennial Star of Bethlehem Colored Baptist Church” under the pastorship of Revered Henry E. Duers a former slave and Civil War soldier. Reverend Duers was invited to attend First Baptist’s centennial celebration in 1890 and as Christmas Day was on the horizon, these events inspired the name for his church. The Baptist congregation however had no building of its own and for many years it continued to meet in the home of Hunter and of other members. Then in 1811, a small wooden building was erected more or less at the site of the present brick gothic-style building on Route 9 and Church Street. In his will dated January 24th 1815, he deed the land and the building to the congregation. This will in part states- “I give, devise and bequeath unto the trustees of the Baptist church in Mt. Pleasant and their successors in office in trust forever the lot of ground wherein the Meeting House now stands and the land as now enclosed with a fence around said meeting House…” He also bequeathed to them “my house and lot of ground…” and the “rents, issues and profits arising from said lot… “. He also gave them a total of :six hundred Pounds” and stipulated that the money be invested in “good, permanent land securities” and that the principle not be touched and that interest be used for the upkeep of the property. Upon the death of, Elijah Hunter, in January, 1816, the Reverend John Stanford delivered the funeral sermon. The text was, &#8220I have finished my course.&#8221 It was a fitting summation of Captain Hunter’s life taken from 2 Timothy 4:7. Indeed, he “fought the good fight” for his country and “kept the faith” by establishing and supporting (even after his death) the First Baptist Church of Ossining. Thanks in part to his efforts the United States came into being, the Village of Ossining prospered and the First Baptist continues into the 21st century and neither the nation, nor the village nor his church have finished the course. Elijah Hunter is buried at Dale Cemetery in Ossining. 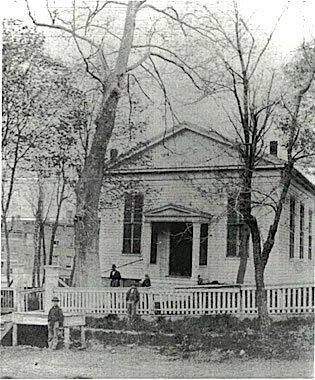 Photo: The First Baptist Church of Ossining as it looked in the early 19th Century. (Courtesy Historic First Baptist Church).